Fiction writing refers to all types of writing that are not factual. It refers to the act of writing a piece with an aim of either conveying the point of view of an author or simply entertaining readers. Among the best examples of fiction writing are novel, screenplay, novella, drama and short story. If you want to become a skilled fiction writer, then maybe it is time for you to look for a reliable fiction writing course so you can start honing your skills in this field. This will allow you to become fully aware of all the essential elements of a fictional story including character, setting, style, theme and plot. A fiction writing certification course is also a major help in your attempt to become more familiar about how the proper characterization process is carried out. Characters refer to the participants in the fictional story and they come in various types. The different types of characters that you will surely learn from enrolling in a reliable fiction writing certification course are point of view character, protagonist, antagonist, foil character and minor character. The certification course will also enhance your skills in effectively developing characters that will act as the heart of your fictional story. Being a certified fiction writing expert requires skills in developing characters that will seem like real, breathing and living people to readers. 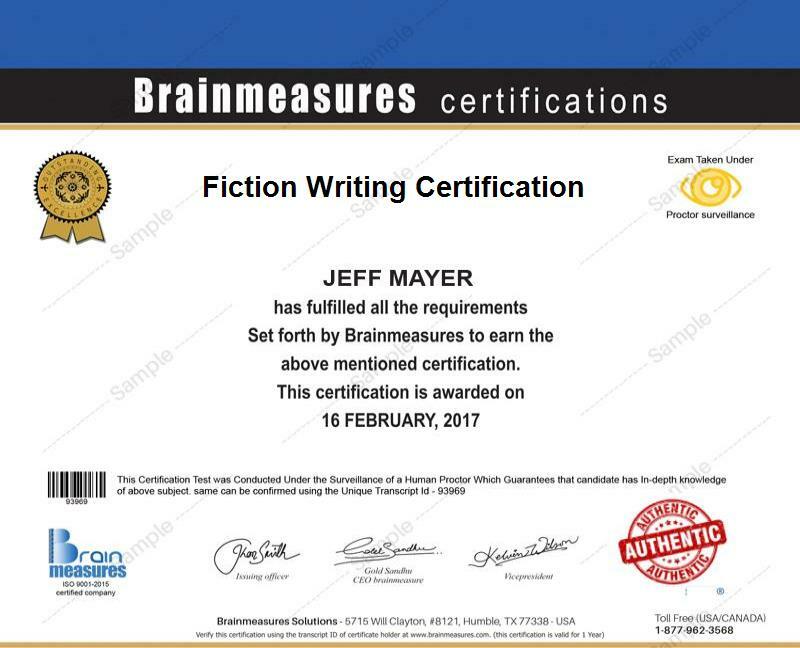 If you are serious about improving your skills and talent in writing fictional stories, then you should consider taking a look on the fiction writing certification program offered by Brainmeasures, a trusted online certification company, as this is proven to offer you the kind of help that you need. The program is comprehensive enough that you will no longer find it impossible to learn everything about fiction writing including the basics of writing the perfect plot. The plot or storyline is considered as one of the most essential elements in a fictional story because it serves as the process of effectively ordering and rendering actions and events. You have to be able to create the best storyline in order for your fictional story to become more saleable. The fiction writing certification program from Brainmeasures is also extremely useful in your attempt to learn more about the different strategies that you can use in writing. You will know exactly how you can start and end your story through the certification course. As a means of assessing your knowledge and skills in fiction writing, Brainmeasures will require you to take the online fiction writing exam at the end of the program. You have to motivate yourself to pass the exam so you can get your fiction writing certificate. The fiction writing certification program offered by Brainmeasures can offer numerous advantages to various individuals whether they are professionals or non-professionals in writing. The course is most suitable for anyone who desires to learn the basics of writing novels, short stories and any other fictional stories while also enhancing their skills when it comes to developing characters, producing vibrant dialogues for their stories and editing and proofreading their writing creations. Because fiction writing is a booming career, earning a huge amount in this industry will never become impossible as long as you have persistence and motivation. As a fiction writing certification holder, your salary will become more dependent upon where your stories are published, the specific type of writing job that you do and the length of the piece that you have written. The average annual salary of a fiction writing expert is $53,000 and this can be expected to increase as soon as magazines and publishing houses start to notice his impressive work.